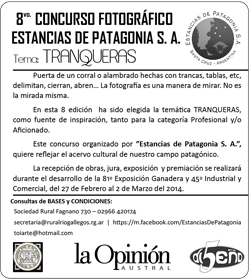 Estancias de Patagonia S.A. is a company of associated farmers, produces, processes and exports Patagonian sheep meat. The vision of this group of producers is based on responsability, fullfilment and excellence of the quality. Equity in the classification and settlement process of the product. Transparency regarding the management of different areas as well as Board of Directors. Estancias de Patagonia S.A. is directed and managed by shareholder producers who exhibit its daily work to other shareholders and interested parties. Horizontal integration, made up by grouped and organized producers. Vertical integration. Estancias de Patagonia S.A. slaughters and processes the stock incorporating added value to the sheep meat. Solidarity evidenced in time of crisis. Social commitment and envirommental responsability in all activities performed. Estancias de Patagonia S.A. was created in 1999 and formed in a moment of crisis. The uncertainty of the farmers grouped in Rural Assosiation of Rio Gallegos gave place to its creation of the Sheep Meat Program of the Province of Santa Cruz, with the commitment of Govermment of Santa Cruz, aimed at mitigating the crisis and involving the producers in a new scheme and perspective. The initial slaughter was of 76,000 ovines. In the season 2005/2006 a record production was achieved: 340,000 animals and export of 3,500 tons of sheep meat, covering 50% of the totaly exportations of sheep meat in Argentina. Due to its continuos work and considerable development, it has become the first processing and exporting company of sheep meat in the country. It gathers 64 shareholder producers and it is supported by more than 40 affiliated producers, all of them own farms in the province of Santa Cruz and Tierra del Fuego, Argentine Patagonia . Estancias de Patagonia S.A. has been continuously participating and offering its products for the last six years in the International Fairs for Food of ANUGA (Germany) and SIAL (France). Nowadays, the Patagonian sheep meet (pride of our Patagonia) is consumed in the most demanding international markets such as Protugal, Spain, Greece and Italy as well as England, Belgium, Germany, the Netherlands and Sweden. Our most important Clients come from these countries.